I was listening to Iron Maiden in the car and came to stop at the lights, so I rolled the window to traumatize the little teeny boppers. I'm in the campus library right now, and there was this really hot girl sitting across from me, and we even accidentally made eye contact a few times, and then she got up and left (probably to go to class) and now I'm sitting here alone. It feels kinda like when a childhood friend moves away and you never see them again. When two ships pass in the night, but then one sinks. This is the one fatality from that explosion. He was a good man. This was the shop that I had my interview in (see below), and we (as a lab) would frequent. Kind of an odd interview. It was very informal. Almost zero questions were pointed to me. I read and read and read about cancer genetics/genomics to prepare, and nothing remotely like that was asked. I will be told by Saturday if I have the job or not. At least it will be quick if it's bad news. On a positive note, found a really nice coffee shop b/c of the interview! I would like to go back and try more things. The espresso was quite good. I didn’t realize this was so close to you. “Can Opener” 11-foot-8 bridge cameras record audio and shock wave from nearby business explosion. Be careful, or your wife is going to add a book about coping with delusional disorder. Have I told y'all lately how much I love all of y'all? Feeling good today, are we? This is more interesting to me because it actually raises questions about the cause of autism. 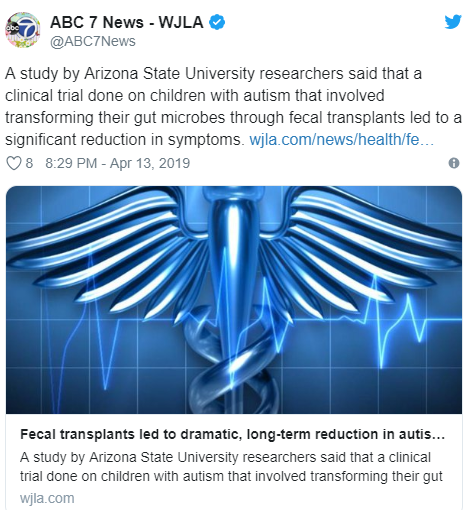 I mean, if gut flora are somehow involved, does this mean that antibiotic overuse has yet another side effect of being a contributing factor to autism? Consider that depression also has a link to gut health, among other mental disorders. I imagine that it would be very hard to single out antibiotics, considering how many other factors are in play. Trends in society that effect digestive health and the microbiome: increased sugar consumption, decreased consumption of fermented foods (especially those with live cultures still present when eaten), increased stress, and probably a lot of other stuff I don't know about, or can't think of off the top of my head. Yes...More and more, there's medical proof for far deeper connections between gut (flora) and brains than one might expect. I don't think some of these "modern diseases" (I'm well aware autism et al existed well before modern times) are *caused* by bad eating - especially since it'd have to be transgenerational to work, and I don't see the benefit of blaming mothers for bad eating and causing autism in their children - yet another way to blame young mothers these days. I won't at all be surprised to find certain food types are unhealthy or have a strong impact depending on bacteria and internal flora and all that, though. If eating chocolate can make you happy, I don't see why eating....McDonalds or whatever, wouldn't influence your brain to increase depressive thoughts or negative thoughts. and I don't see the benefit of blaming mothers for bad eating and causing autism in their children - yet another way to blame young mothers these days. Indeed, especially since some of these factors are beyond anyone's control, and definitely beyond our current level of medical understanding. Microbiome is influenced by where you live, by your genetics (and likely by epigenetics), what you eat, your overall health, but also by interactions between all this. Someone with genetic markers in combination A might benefit more from eating sauerkraut fermented with bacteria in strains of combination L than person with genetic comibation B, but only while they're both living in City X (because that city has a certain type of wild yeast that also makes great sourdough). A certain type of gut bacteria could thrive on excess sugar and produce a toxin that contributes to autism, but only in the absence of another bacteria that's common AND ALSO in the presence of a bateria that's rare, so most people would eat that much sugar and not trigger the issue. Oh, and epigenetics playing a role could mean that a certain combination of other factors only come into play if your maternal grandmother and/or great-grandmother went through a period of starvation. Hopefully, in the future, we'll know as much about the microbiome, and supplementing microorganisms, as we do about vitamins and minerals now. Had not seen that video. That's about a block and a half from the explosion. Yeah, there are just too many potential factors for our current technology to track and mine any kind of gut study. TIL - when people say they're following their gut instinct, what they mean is they're taking advice from little trees growing in their belly. So, a good friend of mine asked me if I could be a sperm donor for her and her girlfriend. She asked me because she wants the kid to know who his "father" is, and not some bio in an binder at a sperm bank. killed the idea of kids for me. to pass that on. Had to refuse her. Also I got a genetic heart defect. Don't want to pass that on. Had to refuse her. Not that you HAVE to give a reason, but this one here is a damned good one. I was out to eat last night and the menu had "chicken eggs" on it. Intellectually I understand that's just eggs, but seeing it phrased like that grossed me and everyone I was with out. Makes no sense, but a weird quirk of the mind i suppose. As opposed to quail? Dodo? Ostrich. Those eggs were HUGE! They had quail eggs on the menu too so I'm sure that's why. Still just seemed weird to read. NO KITTY THESE ARE MY CHEESY POOFS! BAD KITTY! So, Nabisco recalled Chewy Chips Ahoy cookies because of an "unexpected solidified ingredient," with a warning it "might cause adverse health effects" and that, along with the lot numbers, is the majority of the information that most news outlets are running with. It's causing a lot of people to be confused, and a little freaked out, because that vague language sounds very ominous. Presumably they issued the recall as soon as they knew there was a problem, but before they knew for certain that the problem was corn starch that didn't incorporate into the batter properly. CNN managed to get that part of the story, while a lot of other news outlets haven't bothered to get any details. The health effects? Choking, gagging, and possibly some chipped teeth. Pretty much what you'd expect from lumps of corn starch. Chewy Chips Ahoy: now without glass!